This trip report takes place June 18-26, 1999. 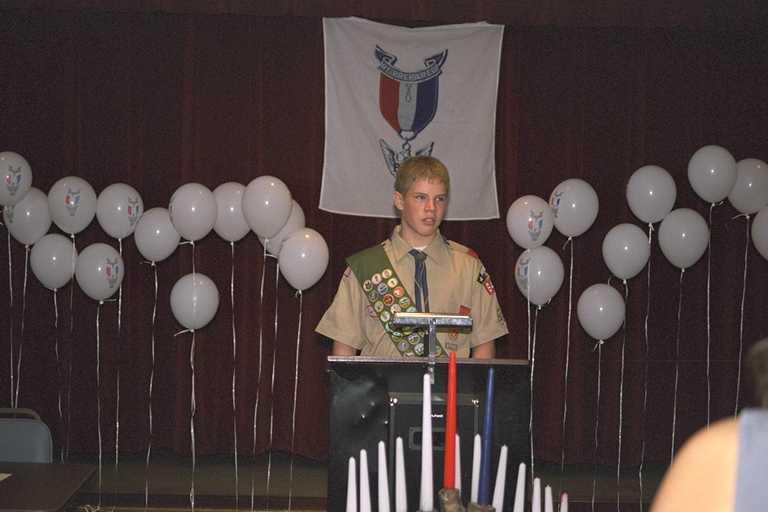 Anne and I attended our nephew, Doug Webb's, Eagle Scout Court-Of-Honor to celebrate his accomplishment, then immediately traveled to St. Louis to help Anne's mom move to Dallas. 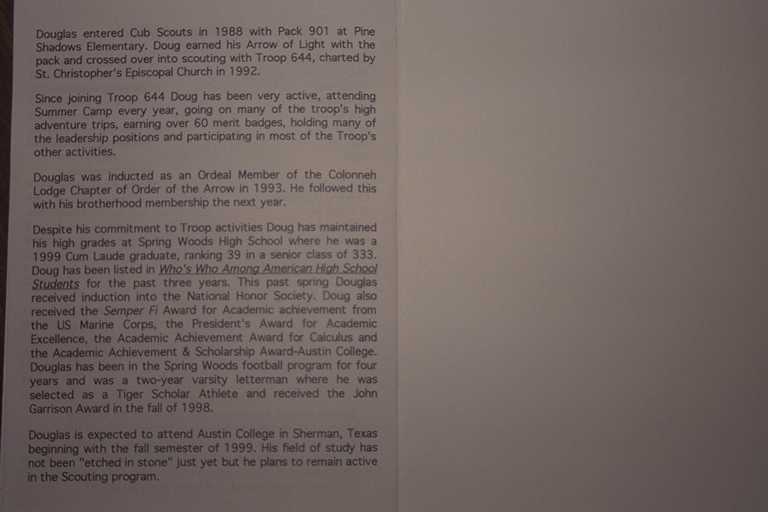 Doug's Boy Scout Court-Of-Honor happened to fall exactly as to dove-tail into moving Esther from St. Louis to Dallas. Anne made careful plans to fly from Houston to St. Louis on Sunday after the Court-of-Honor. Turns out that Southwest Airlines does fly from Dallas to St. Louis, but requires a stop-over in Houston! So it made good sense for Anne to leave from Houston while we were there, then I drove back to Dallas on Sunday. Our plans were for Anne to fly to St. Louis and help Esther to cleanup and shutdown her housekeeping there. She owns a small house on a lake (Lake Wauwanoka) near Hillsboro, MO, about 30 minutes south of St. Louis. She has slowly progressed to the point where she really wanted to be relieved of the responsibility of housekeeping as well as keeping track of her bills and medical expenses. Anne, Esther, Anne's brother Glenn, and I, had explored retirement apartments, nursing homes, and assisted living communities a few months ago. Esther had really liked Dayspring assisted living facility. This was really great since Dayspring is only 1 mile from our house here in Plano! We drove to Houston on Friday for the Court-of-Honor. Anne and I had no idea what to expect. 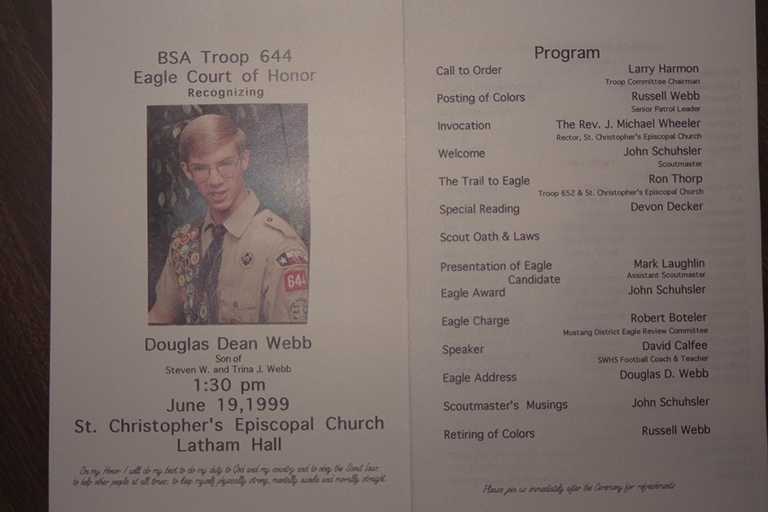 We thought this was a tribute to all the Boy Scouts that had made Eagle Scout, and it was... Thing was though, Doug was the _only_ boy that made Eagle Scout! So the Court-Of-Honor was for him alone. It was quite an achievement. 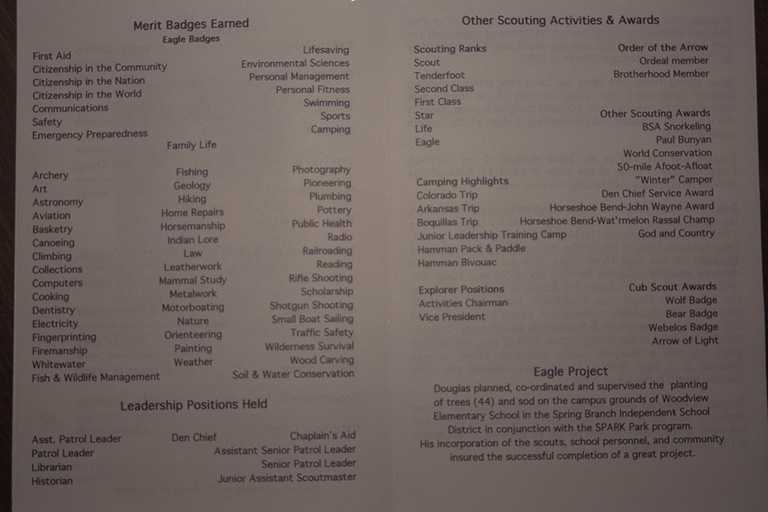 Only 2 % of Boy Scouts manage to achieve this high honor. Anne had to pack for the weekend, and separately pack for the trip to St. Louis. We checked into the Radison where we usually stay in Houston, dropped off our stuff, and headed over to Trina and Steve's house. They were busy, busy, busy getting things ready for the Court-Of-Honor. They had to setup the church where the Court-Of-Honor was to be held, including setting up the tables and chairs, getting the decorations in place, providing the food and generally hosting things. After the Court-Of-Honor Trina and Steve had a big Bar-B-Que planned at their house and they had all that to plan for too! It was very hectic and you could see that both Steve and Trina were hard pressed to make it all work. 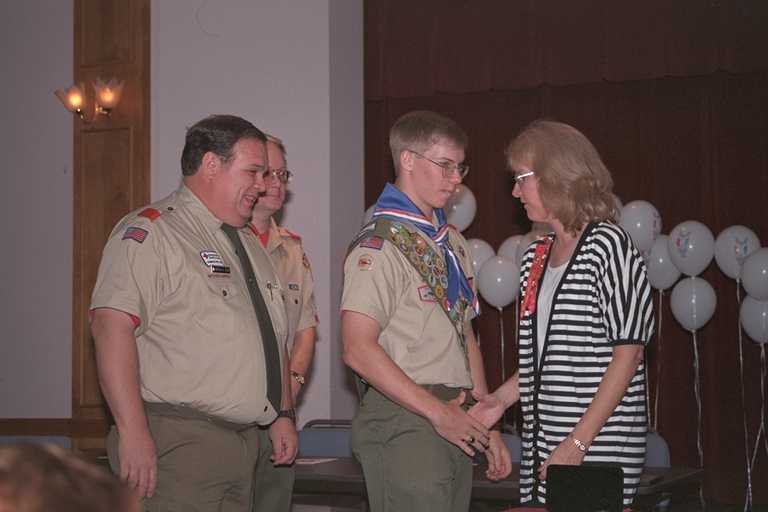 They had friends coming in from out-of-town, old friends that knew Doug as he was growing up (like us) and were very proud to see him get his Eagle Scout. The ceremony was Saturday at 1:30 pm. 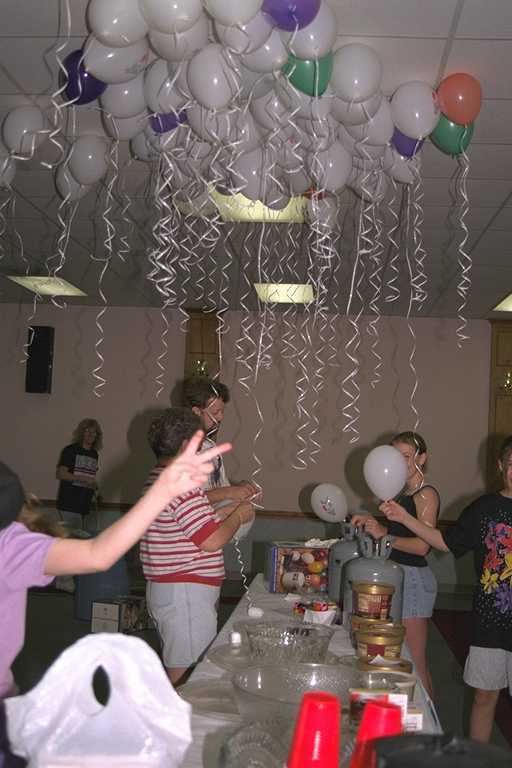 Anne and I had the job of getting the helium and filling about 90 balloons. We enlisted Melanie and her friend Keelie (sp? 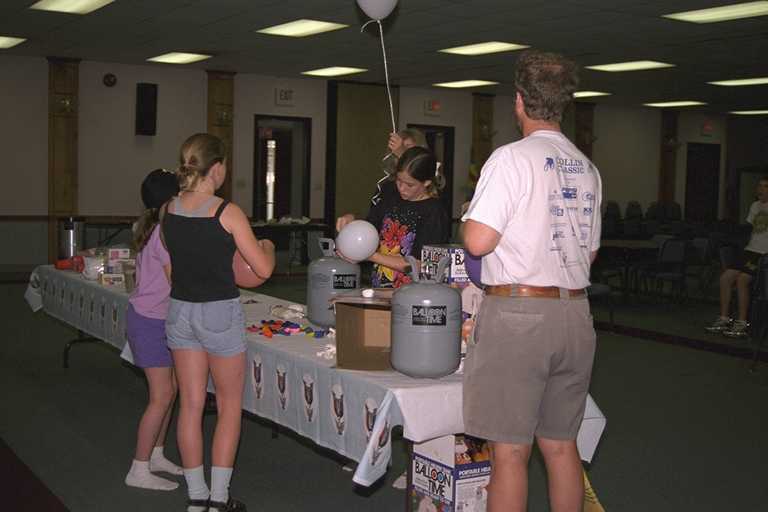 ), Brandi, and Steve's parents Joe and Rita, filling balloons, tying them, stringing them, and distributing them around the hall. 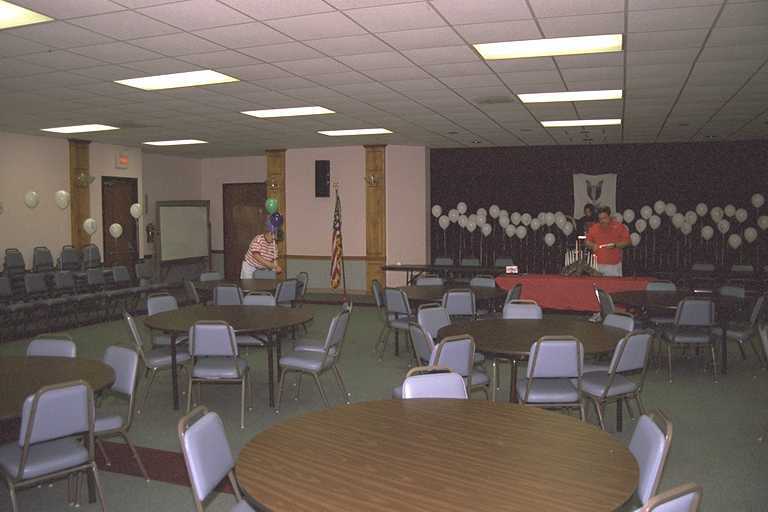 While Steve, Trina and the rest arranged chairs, vaccuumed, setup the Court-Of-Honor memorabilia and stage props. By Saturday at 1:30 it looked great! There were a number of speakers, with Russel, a senior patrol leader, acting as the emmcee introducing each speaker in turn. I've made a photo of the printed program material: First Page Second Page Third Page. The ceremony lasted for about 45 minutes and was wonderful. Afterwards people mingled , eating cake and pie and having refreshments. During the ceremony a tremendous thunderstorm hit. It rained and rained, lightning and thunder. It flooded the parking lot where many of the cars were parked. 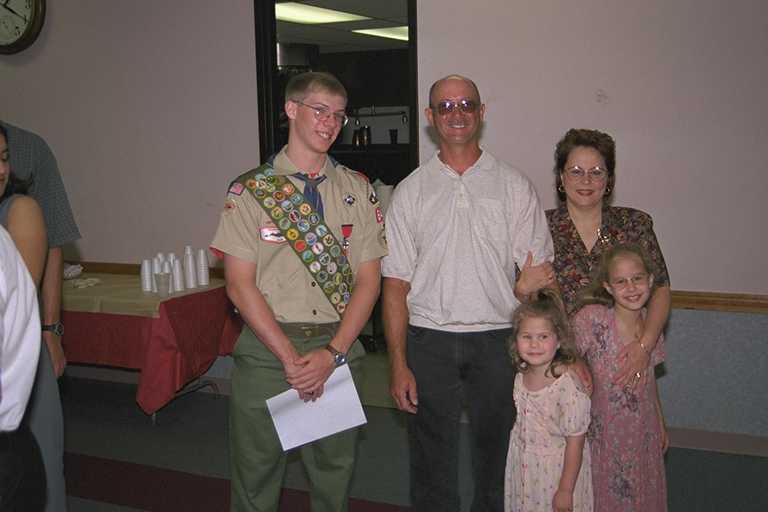 Luckily Steve had anticipated this and had a large tarp mounted in their backyard over the tables and folding chairs. This worked perfectly to keep everyone dry and we held the bar-b-que while it rained. Steve and Trina had a lot of friends over as did Doug. It was a rowdy time and a great tribute to Doug's accomplishments. It was great to see the entire Webb family participating, Steve, Trina, Russel, Melanie, Brandi, Steve's parents Rita and Joe, and of course, Doug. When it was all over Steve looked very relieved. Steve and Doug's work wasn't over. We had got them tickets on Southwest Airlines to fly to St. Louis on Wednesday to tag-team drive Esther's car back to Dallas then on to Houston. Anne and Teresa were supposed to get the car into a repair shop for any and all needed repairs so that it would make the trip, then it would be used by Doug at college in the fall. Although Esther wasn't real happy with Doug getting the car, it was the right thing for both of them. Esther didn't want or need the car anymore, and Doug did. The plan was for Anne to fly to St. Louis on Sunday. Her sister Teresa would drive from Indianapolis to St. Louis also on Sunday. They would take the car in on Sunday night for pickup sometime before Thursday when Doug and Steve would drive it back. Kathy would pick up Steve and Doug at the airport on Wednesday and head over to get the title changed and the sale concluded. Anne and Teresa were to work Sunday and Monday to pack and cleanup things at her house. Anne had made reservations at the Drury Inn for Teresa and herself for Sunday and Monday, then I'd arrive by car on Tuesday and join Anne. Teresa would drive home, Doug and Steve would arrive Wednesday and had a reservation at the Drury for that night. Teresa could not see spending the money when she could spend the night at Kathy's house. Anne revised the reservations and the Drury promptly screwed it all up. We've had 4 reservations with the Drury over the past few years, and they've screwed up 2 of them. We discovered the screw up Wednesday night when Steve, Doug, Anne and I were attempting to check into the additional room. They had no record of the reservation and the confirmation number didn't connect to anything in their computer. They had no rooms available for that night. This really pissed me off and I started making noise. They immediately called over to the Baymont and bought us two rooms. The Baymont turned out to be a better hotel, much nicer, and paid for by the Drury. That turned out great. Teresa however, had problems getting from Kathy's to her moms due to Kathy's schedule problems. On Wednesday Anne and I packed the two cars and cleaned the house out. Doug and Steve didn't arrive until we were completely done. While working at Esthers house I tried to come with an analogy of what it was like. Esther has been living in that little house for 14 years. Over that time she had gathered a lot of stuff and squirreled it away on shelves and in closets in the house. The house was 2 separate cabins joined later by a concrete block addition. The house was old when Esther moved in and wasn't taken care of very well over the 14 years she lived there. Quite simple she couldn't afford much and it had fallen into disrepair. Although she had air conditioning, she didn't use it much due to cost, and the moisture, heat, and bugs had infested the the house with mold, mildew, bugs, and varmints. So try to imagine a large cardboard box that you find in a field, full of stuff, clothes, papers, trinkets, etc. When you open the box you find roaches crawling in and out, spiders, nests of rats and mice, and the overwhelming smell of mold and mildew. Esthers house was like this. Anne put on plastic gloves and had pincher extension that could be used to pull things off the shelves without actually touching them. Anne pulled things off the shelves while I held the plastic bags open. When one got full or to heavy, I would close it, tie it, and take it to the road for garbage pickup. We did this all day until the garbage truck came and picked it all up about 5pm. At that point we were done. There was still a lot of stuff still in the house, most of which probably had some value, and the realtors wife had promised to hold a yard sale to sell off everything. From that point we'll need to hire someone to haul everything else off to the dump or leave it for the new owner. It was tiring work, and very stressfull for Esther. She was pretty strong about it, mostly staying out of our way as we worked. 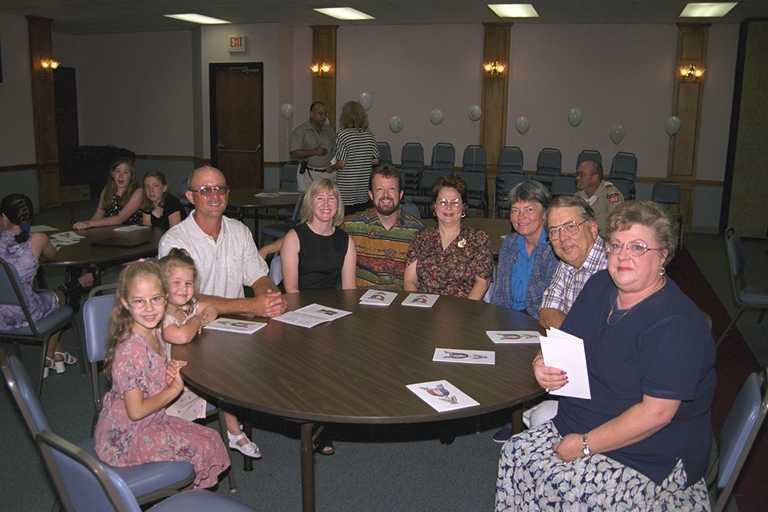 When Steve and Doug showed up, along with Kathy and two of her kids, Ben and Brenda, we left the house for the last time. Esther wouldn't be back, and neither would we. Esther made one last look around and we headed back to the Baymont Hotel. Anne and I needed showers badly, and everyone was ready for dinner. After dinner we made our goodbyes. Anne and Esther were to fly to Dallas the next day, Thursday. Steve and Doug were to drive Esther's old car, now Doug's, back to Dallas. I was to drive our car back to Dallas too, following Steve and Doug. We headed out Thursday morning early, about 6:30am. The Plymouth was ok, except that the air conditioner seemed to drain water into the passenger compartment at the feet of the passenger, and the car periodically blew some black smoke out the back and lost power, and it only got 10 mpg. Yes, that's right _10_ mpg. This last one had a serious affect on our progress. Steve and Doug had to stop to refill when my Toyota had only used 1/4 tank. The worst was 135 miles on 14 gallons. This picked up to 15-20 mpg when they turned off the air conditioner. Problem was though, it was hot out, and it rained like hell all the time we were in Missouri, and in part of Arkansas. We kept going. I had brought some 2-way radios and Doug, Steve, and I kept in contact using these. They worked great and we were easily able to coordinate our activities without having to stop except for gas. It took us just under 12 hours to drive back to Dallas. We arrived at about 6pm. Anne and Esther left St. Louis at 10:20am and had a 2 hour layover in Houston. When they got there they discovered that the flight to Dallas was cancelled! Trina met them there and they visited for a while. They talked with the Southwest Airlines staff and managed to get onto a flight 45 minutes later, for a 2 hour 45 minute layover. Not so bad. Anne's brother Glenn picked them up at Love field in Dallas and ferried them back to our house in Plano. They arrived home about 30 minutes before Doug, Steve, and I rolled in! Wow, good timing. Next day, Friday, we unloaded the cars into our garage and started unpacking and cleaning. Doug and Steve spent some time cleaning the Plymouth trying to get the drain hose unplugged so the air conditioner would work correctly. Anne spent the rest of that day and Saturday washing Esthers clothes and things before we took them over to her new apartment. I spent the time shuttling boxes of books, tapes, CDs, and personal items to her apartment, as well as moving her chair in and generally getting it all setup. After lunch Steve and Doug headed out for Houston. They called about 6:30pm, 6 1/2 hours after leaving (It's usually a 4 hour trip!) to tell us they ran into the worst rain of the trip near Huntsville and they had to sit and wait for the rain and for a terrible accident that caused the freeway to close. But they made it back. Doug now has the job of spending his quarters and getting the car clean, inside and out, and figuring out the a/c problem. But the car runs good, has good tires on it, and will make a fine vehicle for a student to take to college. Anne and I took Esther to her apartment for the first time about 2:30pm on Friday. She was very excited. We had setup the furniture, and installed her stereo, clock, and TV. Glenn and Mina had got her a shower curtain, a bathroom set (soap dish, toothbrush holder, garbage can, etc), a very nice new blanket and bed ruffle for her bed, and two nice lamps. We met Cindy at the entrance and she showed Esther around Dayspring. She was very informative and friendly. Esther started unpacking her stuff, and we started making lists of things that she needed. Glasses, cups, plates, silverware, TV Guide, envelopes, on and on. Things that we never thought of, things that one realizes that they need only when they reach out to get it and find it not there! But most are very easy to get at the grocery and, once gotten, will last a long time. Standard stuff for setting up an apartment. Dayspring is an assisted living facility. This means that they have 3 meals a day in their dining hall. Each apartment only has a small sink, a microwave, and a dorm style refrigerator. Not meant for full meals, but only for snacks, tea and coffee, popcorn, sodas, etc. They supply cleaning services once a week for each apartment. They dole out each persons medications as required. They have regularly scheduled exercise, trips to town, movie nights, bingo, laundry, etc. Most things that will keep the residents busy and happy. Especially since few of them have a car or are able to get out without assistance. The care givers are really friendly, and there are a lot of them. The apartments are very small, really only one room plus a large bathroom. But combined with the huge common areas there is a lot of space available to the residents. The intent is to get them out of their rooms and into a more social situation. It appears to work too. We left Esther in her room. She had dinner at 5pm and apparently got out and met some of her neighbors at dinner. Hopefully she will meet more as time goes on, and as the place fills up. They have 43 apartments there, and it is filling up quickly. Update: Its Sunday, June 27. Esther has been in her new apartment for 2 nights. She has discovered that there is a drain in her shower. It's about 8 feet up, brass or copper, coming out of the wall and turning downward. About 4 inches long. It drips all the time, and at times, it pours water out into her shower. It doesn't appear to have anything to do with her room at all. She called maintenance and they came, looked at it, and didn't know what it was, then they left. She waited a while then pushed the emergency button and summoned help. She told them that this drain would have to be removed. I agree with her. This is going to be a problem. My guess is that it is a poorly designed drain for the air conditioning system on the roof. Why they didn't bring the line on down and tie it into the drain below ground level is anybodies guess. Apparently some of the apartments have this drain is their shower, others don't. Another problem, the woman in the room next door screamed all night, very loud. Esther pushed her emergency button again last night to summon help. They came and told Esther that they had been trying to quiet the woman all night. Esther thinks she might have to switch rooms. I agree with her.